Islamic State (IS) has accepted a pledge of allegiance from Nigeria's militant group Boko Haram, according to an audio message. In the tape, which has not been verified, an IS spokesman says the aim of establishing a caliphate has now been expanded to West Africa. Last week, Boko Haram posted a message saying it wanted to join ranks with IS. 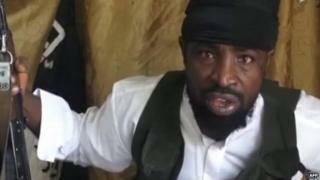 Boko Haram began a military campaign to impose Islamist rule in northern Nigeria in 2009. The conflict has since spread to neighbouring states. In the tape, a man - who describes himself as IS spokesman Mohammed al-Adnani - says: "We announce to you to the good news of the expansion of the caliphate to West Africa because the caliph... has accepted the allegiance of our brothers of the Sunni group for preaching and the jihad." The spokesman also urges Muslims to join militants in West Africa, rejecting suggestions that Iraqi forces and the US-led coalition have recently had a series of victories against IS in Iraq and Syria. The audio tape has not been independently verified. Earlier this week, Nigerian President Goodluck Jonathan told Voice of America (VOA) that Boko Haram militants were travelling to IS camps for training. But he did not specify in which countries these camps were and said it was not known how deep the links were between the two groups. IS aims to establish a caliphate, a state ruled by a single political and religious leader according to Islamic law, or Sharia. Its leader, Abu Bakr al-Baghdadi, is known to his followers as Caliph Ibrahim. In recent weeks, the Nigerian military, aided by a regional alliance, has been taking back some territory from Boko Haram. There are also reports that foreign mercenaries, including from South Africa, have joined Nigeria's fight against the militants. Government spokesman Mike Omeri told the BBC this was not true but that there were foreigners training troops on how to use new weapons. The BBC's Will Ross in Lagos says helicopter gunships and tanks have recently been purchased from South Africa and the former Soviet Union. But the South African government is concerned that mercenaries have taken up contracts in Nigeria. A spokesman at the state security ministry in Pretoria said he suspected that the men were using training as cover but were actually deployed in a fighting capacity, which would be illegal. Our correspondent says many Nigerians question why it has taken so long for the military to take aggressive action against the jihadists. Some question whether the action is political, as elections are due later this month - and were delayed by six weeks to allow for the offensive against Boko Haram. In the audio message posted on Saturday, Boko Haram's leader purportedly said: "We announce our allegiance to the caliph... and will hear and obey in times of difficulty and prosperity. "We call on Muslims everywhere to pledge allegiance to the caliph." IS has forged links with other militant groups across North Africa and the Arabian Peninsula. In November, Abu-Bakr al-Baghdadi accepted pledges of allegiance from jihadists in Egypt, Libya, Algeria, Yemen and Saudi Arabia. IS seized large swathes of Iraq and Syria last year. It still controls the key Iraqi cities of Tikrit and Mosul, despite a major ongoing Iraqi offensive on Tikrit. IS jihadists have attracted condemnation worldwide for their brutal tactics - including mass killings and the beheadings of soldiers and journalists.